Can a tax cut pay for itself? Most economists would probably agree that the answer is generally “rarely, but usually not.” However, this question is often mixed up with a different one – “can reforms that lose revenue on a static basis pay for themselves?” It’s incredibly important to realize that the second question is distinct from the first, and that the answer can easily be “yes.” Tax reform is not a matter of raising or lowering a single tax – it’s a combination of tax cuts and tax hikes, and the swapping of particular sources of revenue for others. Since the economic effects of different taxes differ, reforms that are scored as a static revenue loss (and thus be popularly thought of as a “tax cut”) can easily raise revenue when their economic effects are accounted for. The people who completely dismiss the idea that a tax cut can pay for itself are usually on solid ground when considering a single tax only, but it’s wrong to extend this skepticism to any tax reform that shows a static revenue loss. It is true that with any tax, there is a point where a high enough rate causes sufficient economic damage that further rate increases reduce revenue rather than raise it. For example, an income tax rate of 100% would raise no revenue because there’d then be no reason for anyone to work or invest, and consequently no income to tax. 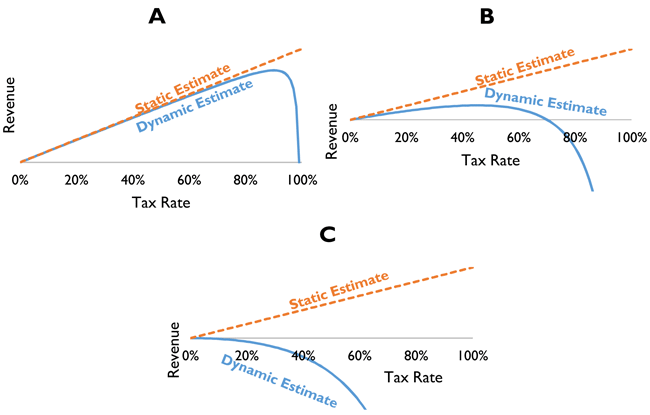 This idea can be expressed graphically as the controversial “Laffer curve,” but the basic concept isn’t disputed – for any tax, there exists a revenue-maximizing rate beyond which further rate increases are counterproductive. The dispute between left-leaning economists and right-leaning economists is therefore not so much over whether the Laffer curve exists (it does) but what shape it has. Tax A is a good tax – that is, one that causes minimal economic damage. Consequently, the static revenue estimate and the dynamic revenue estimate are more or less the same until rates get prohibitively high. Left-leaning economists probably imagine most taxes to look something like this; those who lean right are not as optimistic. Tax B is an okay tax – it causes relatively little economic damage at low rates but the effects start to add up at higher rates; the revenue maximizing rate is about 45%, and beyond 70%, the tax is so damaging to the economy that more revenue would be raised by simply not levying the tax at all (because revenue from other taxes is also depressed by the damaging tax.) Tax C is a terrible tax – even at low rates, the damage it causes is bad enough to cause total tax revenue to go down. Most taxes aren’t so bad as Tax C – it’s an exceptional case. That’s why skepticism is warranted when somebody claims that a tax cut will pay for itself. However, consider a more realistic (but still somewhat simplified) scenario. A government levies two taxes – one looks like Tax A and the other looks like Tax B, both at rates of 20%. A tax reform bill comes along that lowers Tax B from 20% to 10%, and raises Tax A from 20% to 30%. Government analysts perform a static revenue analysis and find that cutting Tax B loses $500 billion dollars, and raising tax A brings in $400 billion dollars. That’s a deficit of $100 billion, and the bill’s opponents argue that such a huge “tax cut” is irresponsible. “But wait!” says a renegade economist. Her dynamic analysis shows that while raising tax A does indeed bring in $400 billion dollars, cutting Tax B has some dynamic economic benefits – certainly not nearly enough that the cut “pays for itself,” but enough that it loses only $400 billion instead of $500 billion in revenue. The static $100 billion deficit has disappeared. At this point, the economist would likely be ridiculed as a crank who believes that tax cuts always pay for themselves. But this is unfair – it’s a distortion of what was actually said. She never argued that cutting Tax B alone pays for itself – that would indeed be an extraordinary claim deserving of considerable scrutiny. Rather, she merely argued that cutting Tax B isn’t quite as expensive as the static analysis would suggest, and that’s enough to make the entire bill revenue-neutral. It’s one thing to laugh off claims that cutting a single tax pays for itself – it’s quite another to dismiss similar claims about a comprehensive tax reform bill. As long as there is a differential between the dynamic effects of the tax cuts vs. the tax increases, it’s quite plausible that the static score shows a deficit increase and the dynamic score shows a reduction. This isn’t the same thing as saying a tax cut pays for itself, and it shouldn’t be treated as such.